Did you know that April is Pet First Aid Awareness Month? 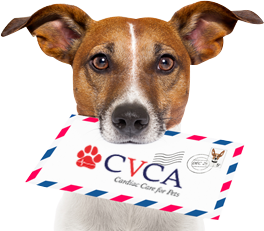 Established by the American Red Cross to bring life-saving tips to pet owners and animal service providers like pet sitters, dog walkers, and groomers, Pet First Aid Awareness Month is something we promote here at CVCA to help our clients handle medical issues at home and while traveling. CVCA Cardiac Care for Pets is happy to announce our Pet Calendar Contest winners. Thank you to everyone who submitted a contest entry. We received hundreds of entries, making the choice very difficult, indeed!